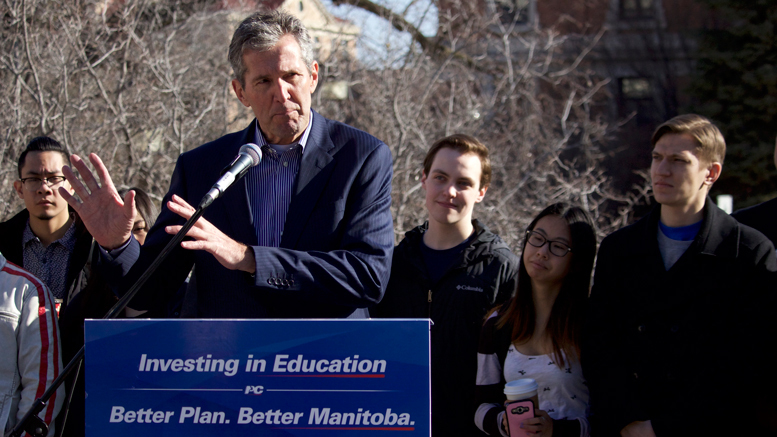 The Manitoba chapter of the Canadian Federation of Students (CFS-MB) is accusing Progressive Conservative (PC) leader Brian Pallister of ignoring students in his campaign for the province’s top office. After the PC leader failed to respond to an April 11 open letter questioning planks of the Progressive Conservative’s post-secondary education platform, CFS-MB chairperson Michael Barkman said he was disappointed the party didn’t come forward with direct answers to his concerns. “As a major political party that is leading in the polls, it is extremely disappointing and problematic that the PC party continues to ignore very legitimate questions from students,” he said, in a written statement. The open letter calls on Pallister to outline the Tory position on three points: tuition, public funding for post-secondary institutions, and Bill 3, which would require universities to have standalone sexual assault policies. Bill 3, the post secondary sexual violence and sexual harassment policies act, was given first reading in the legislature in November 2015 but was not proceeded with and died on the table when the writ dropped for the election March 16. The letter, signed by Barkman, claims both the New Democrat and Liberal parties responded to the CFS-MB request promptly through Twitter. The letter also criticizes the PCs for refusing to participate in a candidates’ debate on post-secondary issues organized by the University of Winnipeg Faculty Association, the University of Winnipeg Alumni Association, the University of Winnipeg Students’ Association and CFS-MB. According to Barkman, NDP minister of education and advanced learning James Allum, Liberal leader Rana Bokhari, and Green Party leader James Beddome all agreed to participate in the debate. University of Winnipeg Students’ Association president Peyton Veitch said the PCs initially declined to participate because a separate candidates’ forum was scheduled to cover post-secondary issues. Even after that debate was cancelled, Veitch said the PCs couldn’t be convinced to participate, which led organizers to abandon the University of Winnipeg event all together. “I am disappointed that the party decided that engaging students on the issues that matter to us would not be a worthwhile investment of time,” said Veitch, who was elected to the national executive of CFS in November, in an e-mail to the Manitoban. The Manitoban requested comment from Pallister but the PC leader was not made available. Lac du Bonnet MLA Wayne Ewasko, who acted as the PC critic for education and advanced learning before the election was called in March, said the PCs held consultation meetings with Manitobans prior to the elections which students were welcome to participate in. “Me personally, plus many of my colleagues, had met with many – thousands – of Manitobans,” he said. On March 27, Pallister announced a plan to double the Manitoba Scholarships and Bursary Fund to $20 million by increasing the government contribution by a little more than $2 million to $6.75 million, while raising the remainder through private investments. According to polling results released Saturday by the Winnipeg Free Press, the Tories are riding on the support of 46 per cent of respondents, with the NDP well back at 21 per cent. The Liberals and Greens are even at seven per cent.